Like I assumed, having a baby would really slow down our eating out. It’s been almost two weeks since J and I actually went out for a meal in Kalamazoo so when we got up this morning, I asked J to get L ready to go out….we needed to find a new place to eat. A couple weeks ago, @jage9 asked me about a new place he saw pop up on Urbanspoon. I hadn’t heard of the place yet, but they had a website and menu online. Next time we were going to head out to lunch, I wanted to hit it up. 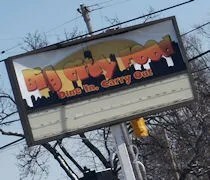 Big City Food is on the corner of Humphries and Main in Kalamazoo Township. Neither J nor I could picture where this actually was in town until we started to get close to the intersection. The corner building used to house a breakfast joint called Our Place. Neither of us realized that establishment went out of business. We never made it to Our Place for breakfast even though they had some pretty cheap specials, so I can’t comment on whether much has changed since the new ownership took over. My guess is no because there is still a lunch counter in the small dining room that has only four booths and about as many tables. When we walked in the door, we were greeted by a voice from the kitchen who told us to take a seat anywhere. We had our choice as we were the only ones in restaurant at the time, but as we ate, a few more people trickled in for a late afternoon lunch on a Sunday. Our waitress came over with a couple of menus then went to get our drinks. I got a Coke while J ordered a Sprite. The menu claims to be “Urban Grub” with a focus on Chicago-Style food. 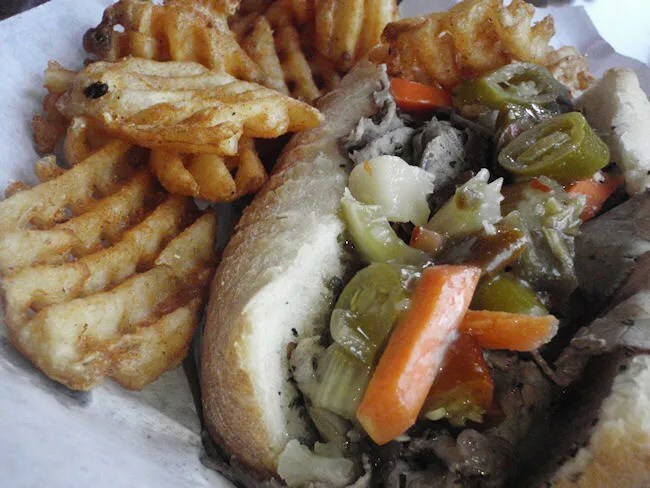 They have my coveted Italian beef sandwich along with a hot dog menu featuring Chicago Red Hots. To make my decision even harder, they also do hand formed burgers with the optiono to add a fried egg. I went back and forth between the burger and the beef, but ultimately went with the Italian beef with cheese and hot peppers which were added on for an extra buck. The sandwich comes in a diner basket with fries for a buck extra. I went with the seasoned fries. They are waffle fries with a cajun seasoning on them. Not spicy, but good. The thinly sliced beef comes in a flaky Italian roll. I was offered extra au jus, but I didn’t really need. The gravy already on the meat had soaked through the bottom of the bun to give me that delicious soggy bread taste that I love about Italian beef. The hot peppers were authentically Chicago hot peppers and piled on the top of the sandwich. I should have took the extra au jus because the top part of the bun was a little dry, but other than that, a pretty delicious sandwich. J kept it pretty simple and ordered the grilled cheese sandwich. For an extra buck she added on fries and went with the regular variety which were standard restaurant fries. 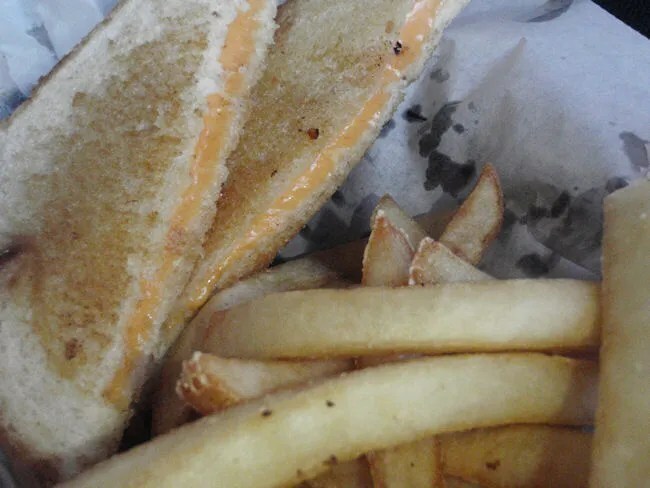 The grilled cheese was a standard grilled cheese sandwich. Nothing fancy, but done in true diner fashion. Our bill was just over $14 and it’s paid at the cash register back near the entrance. We were never given a bill at the table, but when the waitress came to ask about drink refills, she told us we could pay whenever we were ready up front. Big City Food Diner delivered on what they advertised. 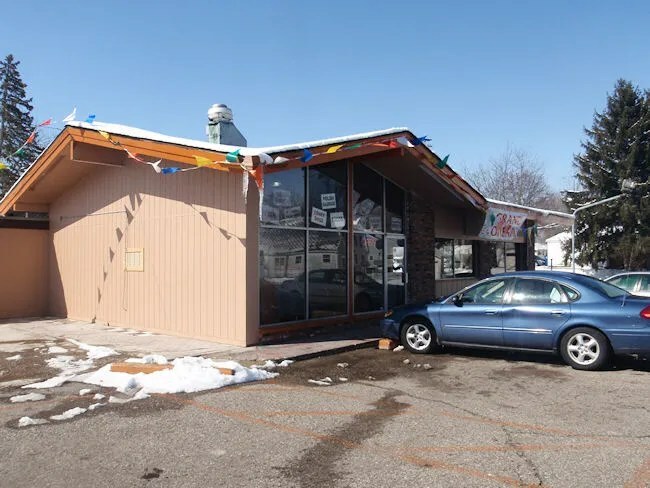 The food is pretty classic diner food with a Chicago twist. The Italian beef was good, but I don’t think it’s my favorite in town.